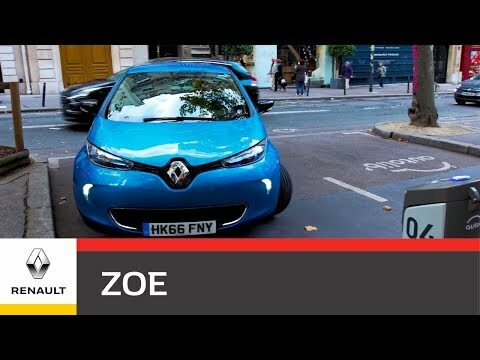 Renault ZOE, the 5-door, compact 100% electric vehicle, a new era is underway! ZOE is the first car designed to be 100% accessible to all and ideal for everyday use. Tomorrow's technology to take care of yourself and your environment today. The Renault Zoe ZE Dynamique Nav comes with a Renault R-Link, which is complete with Bluetooth Streaming, Satellite Navigation and much more! Also included in the price is a FREE wall box fitted into your house so there is no hassle for you and no more visits to the petrol pumps! Once your Zoe is fully charged you could achieve up to 186 miles, at a cost of up to 3p per mile, this is at a fraction of the cost of standard petrol cars. Finance provided by Renault Finance, PO Box 495, Watford, WD17 1BR. Subject to status. Guarantees and indemnities may be required. You must be a UK resident (excluding the Channel Islands) and over 18. Offer based on 6000 miles pa, excess mileage 8p per mile inc VAT. Terms and conditions apply. Offers cannot be used with other schemes or finance offers. Prices and offers shown are available on specified new vehicles ordered from 1st April 2019 and registered before 30th June 2019. Participating dealers only. Price excludes mandatory battery hire from £59 per month for the Z.E. 40 battery, based on 4,500 per annum, excess mileage will be charged at 8p/mile including VAT. You will not own the battery. See here for more information. Vehicle pricing and offers quoted are subject to availability of Government Plug in Car Grant of 35%, up to a maximum of £3,500.